You can now see video from last month’s event “Your Mind Is The Scene Of The Crime” at Dulwich Picture Gallery in London. Inspired by the work of M.C. Escher, the event saw teens exploring comics and biography through thirty boxes containing text and images from the life of a mysterious woman. Over the course of a two-hour session, participants transformed the thirty boxes into individual artworks which together formed a biographical installation: a three-dimensional comic book which used perspective and storytelling to respond to the facts and feelings of a stranger’s life. Read more about Escher, Dulwich, and Your Mind Is The Scene Of The Crime here. Today I’m running an event for Dulwich Picture Gallery’s Off The Wall series of teen workshops. Dulwich is the oldest purpose-built public art gallery in the world and this year I’ve been working with them on outreach events which address 21st century challenges in making art with communities. Today’s event, Your Mind Is The Scene of the Crime, is linked to Dulwich’s current exhibition of M.C. Escher’s work, which was put together by the Scottish National Gallery of Modern Art. Escher is currently undergoing something of a reevaluation, as Darran Anderson captures in his review of the exhibition. The artist, once seen as a creator of mere visual tricks, more suited to student-dorm posters and video game designs than critical interrogation, might now be recognised as influential and intriguing in ways we’d previously overlooked. This process of recognising the artist and his works afresh has parallels to the work of detectives re-opening a cold case; returning to the accumulated files, seeking new evidence, and trying to see it all from a fresh perspective. Solving crimes is never really about arriving at a final truth; it’s about making a story which more closely and convincingly tends to the evidence at hand. This process also applies to the business of art history, and the activities which ran at Dulwich today. Critical examination of Escher’s biography plays a part in our reopened investigation. Divorced from context, sold as a poster, used as the background of an old video game, an Escher landscape can look impersonal, technical, heartless. Nowadays, however, we recognise the ways in which Escher’s mindscapes are grounded in personal experience and observation. His youthful travels in Italy seem to have informed works like Belvedere; Escher’s visit to the Alhambra in Spain shaped his later explorations of pattern and tessellation. Micky Piller, curator of the Escher Museum in the Hague, recently discovered that many architectural elements from the artist’s “impossible worlds” can be found in the stairwells of Escher’s old high school. The view of mathematics and science as purely and coldly intellectual exercises is exposed as inaccurate in Escher’s work; they are at work everywhere in nature; indeed, they are how we interpret the cosmos. Countless books, movies, and shows from Harry Potter to Labyrinth and Doctor Who (which named an episode after Escher’s Castrovalva) have helped us to explore Escher’s cosmos by placing characters within their impossible architecture, lending life and motion to his precise, troubling geometries. The figure of Escher, “modest yet colossal”, challenges our ongoing attempts to pigeonhole creative work. He is at once popular and ubiquitous to the point of banality, yet also marginal, his work set aside by the art-critical establishment. If his work has been dismissed on occasion as a “juvenile curiosity”, perhaps we should think on the current debate in which literary critics disparage YA literature, written for adolescents. Juvenilia has never been a weaker term of critical disparagement, in an era when young people are finally being accorded some of the power and voice to which they are entitled, and in which so many of us still feel the tensions and complications associated with adolescence. If Escher prints like Other World and Relativity are haunted by the traces of the artist’s high school experience, maybe he is the secret YA artist we never knew we had. In Your Mind Is The Scene of the Crime, visitors explore this blend of the personal and perspectival when they are given visual and textual clues from the life of a mysterious woman. These photographs and snippets of prose will form the basis for a collaborative 3D visual artwork, creatively reconstructing a life story from limited cues. In solving the mystery of a stranger’s life, and the challenge of juxtaposing images in three dimensional space, our Dulwich detectives will discover that solutions are only ever provisional; that the neatest account of the cosmos may defy the laws of nature; and that your mind is always the scene of the crime. This Saturday saw teens from volunteer scheme NCS The Challenge join me and staff from Dulwich Picture Gallery at the Bermondsey Street Festival. The NCS teen volunteers will be running their own, completely self-directed art event, PROJECT SCREAM, in Ruskin Park on Saturday 26th September. I’ll be back at Dulwich in December for my event Your Mind Is The Scene of the Crime, an activity which invites you to explore what lies in others’ hearts, delve into the dark side of the gallery, take secrets and lies and make them into art. Your Mind Is The Scene of the Crime is part of Dulwich Picture Gallery’s Escher season. More news soon! This Saturday you’ll find me at the Bermondsey Street Festival alongside volunteers from NCS The Challenge and the staff of Dulwich Picture Gallery, the world’s first purpose-built public art gallery. 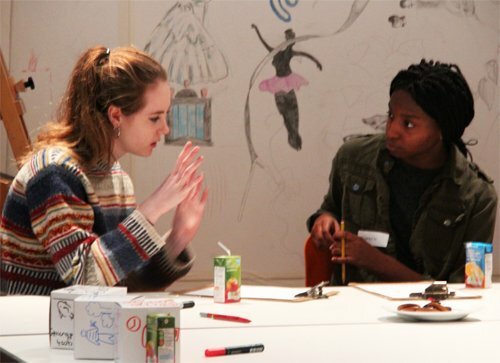 We’ll be running hands-on art events for visitors to the festival, exploring what arts outreach looks like beyond the gallery walls and getting our young volunteers to work as mentors, workshop leaders, and creators in their own right. All very Fun Palaces – can you sense a recurring theme this autumn? There’ll be more from me at Dulwich later this year, with an M.C. Escher-inspired play session in December. Stay tuned.